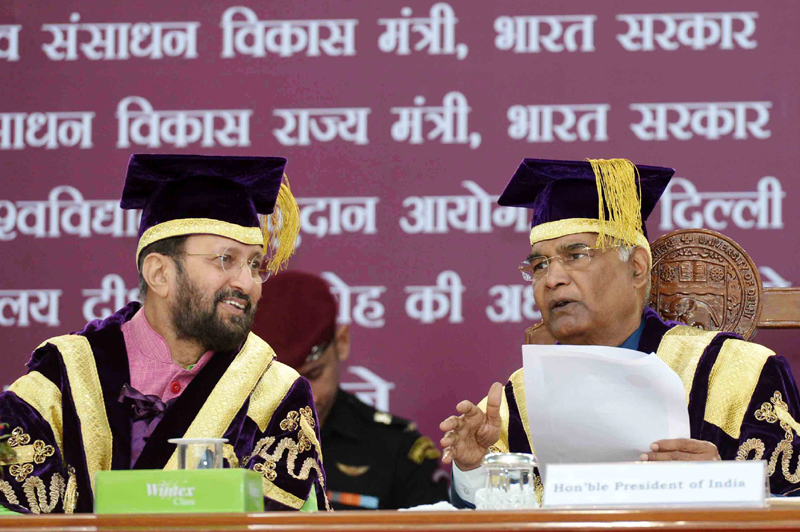 The President of India, Shri Ram Nath Kovind addressing at the 94th Annual Convocation of the University of Delhi, in New Delhi on November 18, 2017. The Union Minister for Human Resource Development, Shri Prakash Javadekar is also seen. 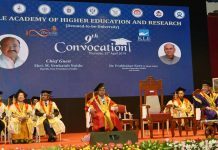 New Delhi: The President of India, Shri Ram Nath Kovind, graced and addressed the 94th annual convocation of the University of Delhi today (November 18, 2017). Speaking on the occasion, the President said that the University of Delhi is in many ways the University of India. Every state and region of our country is represented here. Each year thousands of eager young boys and girls travel to Delhi and apply to the University of Delhi or its affiliated colleges. The University is a big attraction for many young students from the Northeast. They add to the richness and vibrancy of the University campus and of the city of Delhi. The President said that we are entering a world where Artificial Intelligence is changing not just how our society ‘does’ but how it ‘thinks’. We are at the edge of a society of cognitive machines. As such, the challenges and the opportunities before us are immense. The President said that our leading institutions, such as the University of Delhi, will need to adapt as well. They will need to innovate – both in terms of academic content and mechanism of delivery. Traditional barriers between fields that were once regarded as sacrosanct are breaking down. New courses and programmes will have to be devised if our education system is to answer the needs of the next 25 or 30 years. Some of these may call for adopting a multi-disciplinary or inter-disciplinary approach. The President said that the capacity of physical classrooms is obviously limited. We need to explore how we can use technology to take scholarship and education further. The University of Delhi, like many other universities across the world, has taken steps to begin Massive Open Online Courses. As broadband penetration deepens in our country, the President saw great hope in the MOOC platform in the years ahead. It has an exciting potential to democratise knowledge. The President said that higher education serves many purposes. It prepares students for the job market. But that is only one purpose of higher education. At the end of the day, universities are truly meaningful only if they promote the adventure of learning and the exploration of knowledge. Blue-sky innovation is the test of a genuinely world-class higher education system and institution. The President said that it is critical to find the right balance between these different demands on our universities. Quick wins have their place, but universities cannot lose sight of the long-term goal of building a knowledge society. The President said he had been told that there were certain vacancies at the level of college principals and senior faculty positions. He was confident that the University authorities and college managements are taking all steps to fill these positions at the earliest.